If you are a fan of the Dilbert cartoons, you are a fan of Scott Adams. With the Dilbert cartoons, Adams nailed the sweet spot for a comic strip about working in an office. This proclamation is a reminder to myself just as much as the people I work with. We are all subject to the demons of stupidity in our own unique ways – individually and as organizations (as Dilbert so effectively illustrated). This cartoon helps keep me humble as well as eternally vigilant. A sense of humor makes the lesson easier to remind myself. And to reinforce to others. Over the past 3 years, I’ve become a fan of Scott Adams for other reasons. The main reason is his almost-daily commentary and analysis of current events on his Periscope channel. If you aren’t familiar with Periscope, it is a livestreaming social media platform owned by Twitter. If you want to do a livestream and have a Tweet go out automatically to all of your Twitter followers so they can patch in (or watch the reply after you stop the broadcast), you use Periscope. He did something remarkable about three years ago to catch my attention. It was in the early days of the primary season for the US Presidential election. You should recall that in that time period, there were at least 11 candidates for the Republican ticket. The first debate had all of them on the stage. It was hardly possible to give them all an equal and fair amount of time to answer questions. It was during this time that Scott Adams made an outrageous prediction: Donald Trump would win the nomination. Not only that – if he was right about this prediction, then Donald Trump would win the general election and become the next President of the United States. This seemed like a crazy – literally, an insane – prediction. There were four professional politicians, led by the establishment favorite Jeb Bush, who all seemed to be in the obvious race to become the ultimate nominee. This is a long windup to a book review, I bet you are thinking. But the argument for Adams’ prediction was very convincing to me. It’s also one of the secrets to success he talks about in his book, How to Fail at Almost Everything and Still Win Big. After hearing Adams’ prediction and rationale in the early election season, I got impressed with his knowledge and reasoning. Then, as you obviously know by now, his prediction proved correct. Here is the bigger point: he was correct for the right reasons. It wasn’t a lucky guess. Anyone who has that much understanding of how the world works and can predict such “black swan” events deserves to be learned from, no matter what their “day job” is and no matter what impressive education or title you may have yourself. Career development isn’t only a concern for rocket scientists, of course. Everyone who wants to become a productive, happy, and successful adult needs to learn how to have a fulfilling and productive career. The other major point of my book is, what “rocket scientists” used to do to start their career is not the same as what a person needs to do today. Or can do. Our world has changed a lot. In good ways! In amazing, fantastic ways in fact. The opportunities are incredible and abundant. Sometimes it just takes someone who has blazed an innovative trail to offer some pointers, lessons, and strategies from their own experience to help someone else along the journey that will be right for them. With this attitude, we can all learn from anyone who has achieved innovative success in their career. By the same token, like the lessons we learn from accident investigations in aviation disasters, we can learn from other peoples’ failures too. So after listening to and learning from Scott Adams for a couple of years through his “Coffee with Scott Adams” morning Periscope sessions, as they are now called, I was in my neighborhood book store and found the only copy remaining in stock of this book I’m about to tell you about. Is he as wise and relevant for career advice in our modern age as I think he is? You are about to find out with my review of his book How to Fail at Almost Everything and Still Win Big. 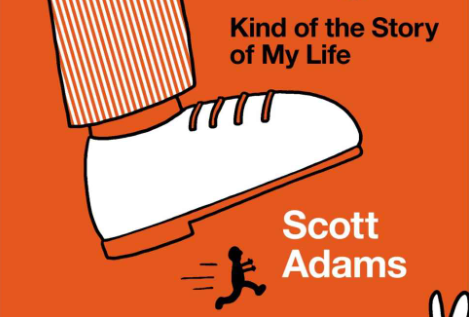 Here are some other things you should first know about Scott Adams. He isn’t only the author of the comic strip “Dilbert.” He also has a BA degree in business and an MBA. He is also a trained hypnotist. And he is a former member of Mensa. The takeaway: you never know what other secret knowledge, talents, and skills someone might have who you meet. It’s best to assume that they have something. What that may be, you just don’t know yet. Here are two other burning questions you are more likely to be suffering from. How (the bleep) did Donald Trump become President of the United States? Is our country in existential peril with Trump as President, or are we in the beginning of a new Golden Age? This was the longest buildup to a book review I’ve ever done. Thanks for continuing to read along with me. Now let’s review the book and answer all these questions. The book opens with a very humbling lesson that Scott Adams learned on one of his first job interview trips. On the airplane flight to his interview, he happened to find himself sitting next to a CEO. That CEO gave him some priceless advice which I will share with you here. But not quite yet… we need to put it in context first. The first major lesson in the book is a new take on goals. Goals are for losers, he states bluntly. This is very contrarian – even offensive – to hyper goal-oriented people like me. What is the winning alternative? Create and USE SYSTEMS instead. Since I am someone who worked for may years in a systems engineering role, and who is a strong advocate for systems thinking, my offense at his opening claim didn’t last long. I was eager to read and learn more. His argument is that if you use a robust and reliable system to guide your behaviors, the results will work out for themselves. Goals may come and go. Goals come with pressure, deadlines, setbacks, and more goals once you have achieved the first one. Weight management and dieting is the best example which he also uses in the book. We probably all have a goal to lose weight. (I do too.) But what if we instead had a reliable and healthy SYSTEM to achieve and maintain our desired weight, no matter what the number is? I have been convinced that this is truly a better way to approach the topic. With a reliable system, you don’t need to rely as much on your self-discipline and will power to constantly be fighting to achieve a certain goal. Let’s remember not to take advice to extremes, however. Goals still have purpose and value. If your goal is to get your first job out of college, or work in a certain field, that’s fine. The point from Adams is that you should design a SYSTEM that is guaranteed to move you in that direction and achieve that result eventually. Then you use your system to make it happen. The second big lesson I got from the book was about decision making. This is something I have learned and wish more people understood. It is the difference between WANTING something and DECIDING something. You may have heard about the 10,000 hour rule from Malcolm Gladwell. If you want to become a master at an artistic craft or sport, that’s how many hours of practice you will need. I can guarantee you that I’ve spent at least 10,000 hours playing piano during my life. It never became my full time career. But if you were to hear me playing piano, you could tell I had a lot of practice. If you want to practice as a doctor or an attorney, you know you need to get a relevant degree and then pass the state exam for certification in that field. That’s the price you need to pay to work in those fields. Decide you are going to do it, or not. Wanting to do it doesn’t matter. Do you ever catch yourself saying, “I would like to…” do or say something, or do you just do it? DECISIONS, NOT DESIRES, MATTER is takeaway #2. The next big lesson is about personal energy. It has an important distinction from passion. Hopefully you have taken at least one personality test for yourself. “Know thyself” is where we all need to start in our quest for knowledge. The most effective way to determine if you are an introvert or extrovert, in my humble opinion, is to reflect on what type of situation (a) energizes you and (b) drains you. Is it being by yourself or being with other people? This aspect of yourself is only one dimension of your personality. The easiest and largest success comes from pursuing efforts that capitalize on your natural strengths, characteristics, abilities, and interests. These will tap into your personal sources of natural energy, not necessarily your passions. As another quick example, we all have our own unique biorhythms. What time of day do you have the most energy? And what kind of energy is it? Our physical and mental energy has its own rhythms. They are different! You need to be aware of yours and use it if you are going to make the most of your time on this Earth. The book had other very useful ingredients for a system (not goals) to win big. It isn’t fair to give them all away here. You’ll learn about them when you read the book. Knowing whether to quit or persist. Is what you are doing a long experience in failure or is it the rough journey to an epic win? This is the question we all struggle with. I know I have. The quality of your early work can be poor. The market feedback is what counts more. Ignore the average response. If you have a few passionate fans, persist. This advice is very consistent with the proven and innovative approach from the Lean Startup, so I like it a lot. UVP is Unique Value Proposition. When you find yours, you’ll have a path towards success that may have a lot of failure along the way (failing at almost everything) but still be a ticket to win big. If you don’t understand what #2 means, I recommend you read the book to understand. The idea is that a combination of certain mediocre or “passable” skills are exponentially more valuable that the individual skills in isolation. My own experience has proven this true. An honest look at our digital age should convince you of this too. He lists about 20 skills that everyone should have for themselves. I’m not going to list his complete list of recommended skills you’ll find in the book. That wouldn’t be fair to Scott Adams. Here is an excerpt of the list with resources that I can personally vouch for as recommended solutions. Full disclosure, some of them contain affiliate links that give us both an additional benefit if you use it. The most important skill I think he missed: PROJECT MANAGEMENT. Life is a series of projects. If you don’t learn how to get stuff done – by yourself and with other people, on time, within budget, and with acceptable quality, you will never succeed in life. You don’t need to get a PMP certification like me, but getting some type of training or mentoring with project management would definitely be on my list for a modern skill stack. He gives a big lesson which I have also learned through my sales experience: most people act on emotions (not reason), followed by rationalizations. So paradoxically, it becomes most rational to interact with people knowing this. But you should still use this knowledge with integrity and honesty. His book continues with some recommendations for a successful life. Diet: learn how to change your desires and replace your guilty pleasures with healthy alternatives. Health: make daily physical activity a part of your routine. Then you don’t need to schedule exercise. Let’s return briefly to Donald Trump. The answer to your burning questions, according to Scott Adams, is that Donald Trump has done two things. He has built a winning skill stack for our modern age. He is a master of persuasion. Reflect on his career trajectory before becoming President, and this will probably help explain his success to you. Business, high stakes negotiating, beauty pageants, book publishing, reality TV, social media… he has learned how to succeed at them all. It’s a very powerful combination. Now let’s return to the airplane trip when Scott sat next to a CEO. It turns out, the CEO was working a system. He shared some of those system frameworks with Scott Adams. Here is what he said. Your next job is not the one you are interviewing for. The entire world is your next potential job. In the same way, your current “job” is not your job. Your job is to find a better job. Your goal is not to have a job and do well at it. Your system is to always be looking for the best job that you can do in the world, no matter where it is, who it is with, and what it looks like. With this advice, you can fail at nearly everything and still win big. Thanks for a great book, Scott Adams. It is valuable career advice for everyone in today’s world, even (or especially) for aspiring rocket scientists. This post took me a few weeks to write and probably took you a long time to read. Thanks for making it through with me. If you made it this far, please interact with a comment below, share this article, or add the book on your wishlist for purchase later. Great review of Scott Adams’ “How to Fail..” book! Like you, I also effectively discovered Scott in 2015 during the primaries season. Before that I knew about Dilbert and his blog, but wasn’t an avid reader of it. I knew his writing was intellectually stimulating and was reading his blog on and off. After 2015 though, he has become my hero. I have been watching his periscopes since, hardly ever missing one. His ideas have positively changed my life and continue to do so. He’s a remarkable human being. I’ll check out more of your blog. It seems to be essentially about the same thing that I’m enthusiastic about – improving life.